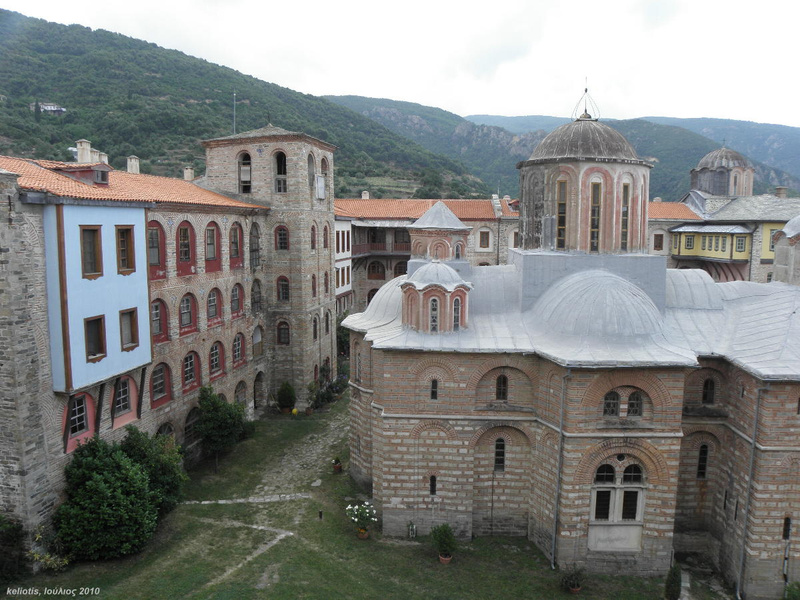 According to the Russian pilgim Vasily Barsky, who visited Mount Athos twice (1725 and 1744), when Emperor Romanos went to Mount Athos with the Patriarch of Constantinople to consecrate the newly-built Church of the Holy Forty Martyrs at Xeropotamou Monastery, while it was being sprinkled with Holy Water by the Patriarch and he was proclaiming the names of the Forty Martyrs, a miraculous sign took place. Below the Holy Altar, a large mushroom with forty roots and forty heads sprung up, and it wrapped itself around the Altar. This astonished everyone and they glorified God, for they realized it was done in honor of the Holy Forty Martyrs. The miracle was not a singular event, but it took place every year on the feast of the Holy Forty Martyrs. Barsky says that he not only heard this from the oral tradition of the monks, but he also read about it in Greek and Bulgarian manuscripts. During the reign of Emperor Michael VIII Palaiologos (1259-1282), a union took place between the Orthodox and the Latins at the Second Council of Lyons in 1274. The Emperor replaced Joseph with John Bekkos as Ecumenical Patriarch (1275-1282) to promote the union. Among those who did not accept the union were certain monastics of Mount Athos. Crusader soldiers were therefore dispatched to Mount Athos to ensure they accept the union or face dire consequences. Many monks of Mount Athos still refused to accept the Union of Lyons, so the Crusaders had many of them tortured and killed. Among the well-known martyrs of this time are the 26 Martyrs of Zographou, Saint Kosmas the Protos, and monks from Iveron and Vatopaidi monasteries, among others. However, when the Crusaders came to Great Lavra and Xeropotamou, they were welcomed with incense, for these monks had heard of the fate of their fellow monastics, and they became cowards in the face of having to suffer for their faith. Escorting them to the Church of the Holy Forty Martyrs, there was a concelebration of the Divine Liturgy, and to express their obedience to the terms of the union, the monks communed with the Crusaders and Unionists. Having communed together, suddenly a great earthquake struck the Monastery of Xeropotamou. The church and walls of the Monastery fell, and many of the cells were destroyed. Struck by fear, the Crusaders left Mount Athos after this, and the other monasteries were spared. Many years passed before the Church of the Holy Forty Martyrs at Xeropotamou was rebuilt, and this took place during the reign of Emperor Andronikos. However, the mushroom never sprouted again on the feast of the Forty Martyrs, for they had given "what is holy to dogs." Instead, the spot below the Holy Altar remained empty, in remembrance of the miracle which used to take place, as well as to remind them to never betray the Orthodox faith again.